Toronto’s architectural gems—the Dineen Building on Yonge St. The Dineen Building at 140 Yonge Street, on the northwest corner of Yonge and Temperance Street has recently been restored to its former glory. In the 19th century, the site was occupied by the “Dineen Hat and Fur Company,” which relocated to these premises in 1897. The cost of the new premises was $30,000. They maintained their showroom on the first floor, facing Yonge Street, and on the upper floors they manufactured hats and fur coats. Large security safes were installed to store the valuable furs. When the building was recently restored, many of the safes were discovered, covered by drywall. The Dineen Hat and Fur Company rented out any space in the building that was in excess of their needs. Thus, the building was also an income property. When it opened in 1897, it was in the heart of the retail district of Toronto, which centred around Queen and Yonge Streets, where Eaton’s and Simpson’s department stores were located. At the time, it was one of the most attractive buildings in the downtown area. Having now been restored, it is again a very handsome structure. An ad in the Toronto Telegram newspaper of 1897 advertising a special sale. This photo of Yonge Street shows the Dineen Building on the left. The view is looking north on Yonge toward Queen Street, c.1910. The large Romanesque-style building on the right, with the pointed roof, is the Confederation Life Building. This photo is likely from the City of Toronto Archives, but was located on the Wikipedia site. The south facade of the Dineen Building, facing Temperance Street. The entrance to the building is particularly impressive, with its Roman archway. The windows are also topped with Roman arches. The entrance to the building on the south side. The recent restoration has meticulously restored the building’s architectural detailing. The coffee shop on the ground floor was once the showroom of the Dineen Hat and Fur Company. Juliet balconies on the Dineen Building that have been restored. An office on the third floor, contained within the rounded brick facade that curves around the corner of Yonge and Temperance Streets. Today, in the Dineen building, it is possible to rent space on a daily basis or for any number of hours a client prefers. This is referred to as “hot-desking.” Is an ideal concept for companies or individuals that require office space within the downtown area for a limited period. The company provides internet and other services that their clients might require. There is also a lounge area in the basement that is suitable for conferences and meetings. One of the lager safes that was discovered behind the drywall in the building. It is over 100 years old, so cannot be opened until supervised by the proper historic authorities as it is an artefact. It has remained unopened for 90 years. Interior space in the Dineen building. The heritage property has a warm and inviting atmosphere. These photos were taken on a Saturday during “Doors Open Toronto,”when the office space was in darkness except for the light from the windows. The restored Dineen Building is a welcomed addition to the downtown scene, its warm yellow bricks contrasting with the glass and steel towers surrounding it. The above photo was in the Globe and Mail on May 29th, 2013, on the occasion of the 99th anniversary of the sinking of the Empress of Ireland in the St. Lawrence River, four miles off the coast of Quebec. This CPR steamship was rammed on its starboard side in the early-morning hours of 29 May 1914 and sank within 14 minutes. Only four of its 40 lifeboats were ever launched. On 28 May 1914, the ship set sail from Quebec City with 1057 passengers aboard and a crew of 420. Of the 1057 passengers, only 465 survived. There were 1012 victims, including 134 children. Of the 420 crew, 172 perished. This disaster was Canada’s greatest maritime tragedy. More passengers drowned on the Empress than on the Titanic, although the final death toll was higher on the Titanic as more of the crew perished. Today, the wreck of the ship lies at a depth of 45 metres, deep at the bottom of the St. Lawrence River, 4.5 nautical miles from the town of Sainte-Luce-sur-Mer. Onboard the ship were many members of The Salvation Army, including its Staff Band and many administrative officers. They were travelling to Britain to attend an International Congress. Many perished, including all but 12 of the band. Every year since the tragedy, The Salvation Army has held a memorial service in Toronto’s Mount Pleasant Cemetery to honour those who died on the fateful day. This year there was a crew from the CBC Montreal present at the ceremony as the CBC is producing a film for TV to mark the 100th anniversary of the sinking in 2014. Also present at this year’s service was the Amsterdam Staff Band from the Netherlands, which provided the music for the service. It was a deeply emotional service, despite the passing of nearly a century. A postcard that went ashore from the Empress with the mail ship from Pointe-au-Pere (Father Point) on the evening of 28 May 1914. Waves of the Atlantic pounding the bow of the Empress. The ship was launched on 27 January 1906, and during its years of service carried 187,000 passengers, mostly immigrants, to Canada. One of the seven decks of the Empress. The Storstad, the ship that rammed into the starboard side of the Empress. It was loaded with coal being shipped from Nova Scotia, and was travelling up river to take on a pilot at Pointe-au-Pere. The Salvation Army funeral service for the victims was held in Mutual Street Arena, which in 1914 was the city’s main sports arena. Photo from the City of Toronto Archives. The Salvation Army funeral service in Mutual Street arena. The graves of the victims of the Empress in Mount Pleasant Cemetery and the plinth that commemorates the tragic event. The Canadian Pacific Building at 1 King Street East, on the southeast corner of Yonge and King Streets, also possesses the postal address of 69 Yonge Street. Located immediately to the north of the Traders Bank, for a few years the fifteen-storey CPR Building was the tallest skyscraper in Canada and the entire British Empire. Previous to its completion, its neighbour beside it, the Traders Bank, was the tallest structure. The CPR Building, built between the years 1911 and 1913, was the corporate headquarters of the Canadian Pacific Railway. Its magnificent ticket office was on the ground floor. The company also rented any space that was in excess of their needs to other companies. Designed by Darling and Pearson, the CPR Building was one of the firm’s crowning accomplishments. 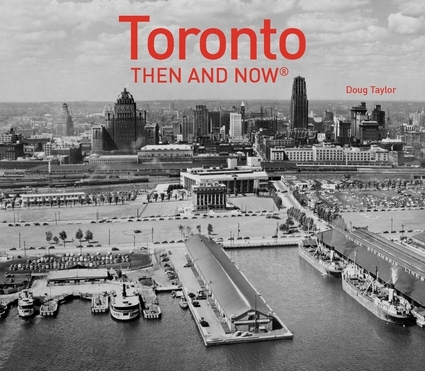 The architectural firm designed buildings across Canada between the years 1897 and 1923. In Toronto, they were the architects for the West Wing of the Royal Ontario Museum, the Bank of Commerce (now Commerce Court North), and the Summerhill CPR Train Station. This photo from the collection of the Toronto Reference Library, shows the CPR Building in 1910. The ticket office occupied the equivalent of two storeys. It was an impressive hall that contained marble floors and decorative columns. In this photo, the buildings first three floors were clad with granite, but the remainder of the floors (4th to 15th) with terracotta tiles. Unfortunately, the tiles weathered poorly and were replaced in 1929 with Indiana limestone. After the building ceased to be owned by CPR, the signs on it were removed, but traces of them remain visible on the north and west facades. The words “Canadian Pacific” are visible today on the north facade. The base of the CPR Building that housed the grand ticket hall. The old Traders Bank can be seen to the right (south) of the CPR Building. Decorative trim above the second floor and the lettering (in the lower left-hand corner of the photo) from the days when it was the CPR Building. Toronto’s Queen’s Wharf Lighthouse on Lakeshore Blvd. A small lighthouse located at the foot of Bathurst Street, is in a small grassy park hemmed in by the busy lanes of traffic on Fleet Street and the Lakeshore Boulevard. It seems strangely out of place, as it is situated a considerable distance from the water’s edge. However, it was once played an important role in the life of Toronto’s harbour. The “Queen’s Wharf Lighthouse,” for over fifty years, guided ships into Toronto Harbour. In 1834, when the town of York was incorporated and renamed Toronto, although the harbour was busy during the shipping season, facilities for exporting and importing goods remained quite primitive. Visitors that disembarked at the western end of the harbour were forced to step directly on to a muddy shoreline as there was no wharf. There was a wharf at the eastern end, and though more convenient for passengers, it was a hardship to unload supplies destined for Fort York from this wharf. As a result, in 1837, the British Parliament in London granted funds for a wharf to be constructed closer to the fort, near the foot of Bathurst Street. The new wharf was originally referred to simply as the Government Wharf, or the King’s Wharf. However, Queen Victoria ascended the throne the year the construction on wharf ended, so it became the Queen’s Wharf. During those years, there was no passageway to enter the harbour at its eastern end (today’s eastern gap did not exist), so the western entrance was the sole channel for ships entering or departing the harbour. The year after the wharf was completed, a small lighthouse was built on it to guide ships into port. This was deemed necessary since the entrance was shallow and treacherous, especially when there was fog or a brisk western wind. This sketch depicts the Queen’s Wharf in 1838. The view looks east toward the small city of Toronto, nestled along the shore of the harbour. The wharf extended about 130 to 150 feet into the harbour. The small lighthouse originally built on the wharf is visible. Sketch is from John Ross Robertson’s book, “Landmarks of Toronto, Volume I,” published in 1894. A close-up view of the 1838 lighthouse. As shipping had increased, in 1851 an additional 70 feet was added to the wharf. The new portion extended to the west, rather than further out into the lake. This assisted in controlling the sand that was continually clogging the harbour entrance. In 1861, they built a new lighthouse—the “Queen’s Wharf Lighthouse”—designed by Kivas Tully, who also created the plans for the lighthouse keeper’s cottage. The new lighthouse was located on the west side of the wharf that pointed southward. Then, they constructed a smaller lighthouse on the arm that extended westward. The first lighthouse was painted white, and the second (the smaller one) was painted red. The latter lighthouse is the structure that resides today on Fleet Street, a short distance to the west of Bathurst. This photo was taken in 1925, when the red lighthouse was no longer in service but remained on its original site. The lighthouse keeper’s house is in the foreground. City of Toronto Archives, Series 393, s. 393, It.19984. The lighthouse in 2013, after being relocated to its present position in 1929. Details on the lighthouse in May of 2013. Toronto’s architectural gems—Traders Bank on Yonge St. The impressive early 20th-century building at 61-67 Yonge Street is today somewhat hidden among the soaring skyscrapers of downtown Toronto. However, when it was constructed in 1905, it was the tallest structure in the city. It was the second building in Toronto to be referred to as a “skyscraper,” the first being the eleven-storey Temple Building constructed in 1895, on the northwest corner of Richmond and Bay Streets. The Temple Building has since been demolished. However, the Traders Bank still exists as a reminder of Toronto’s architectural past. It is 15 storeys and for a few years was the highest building in the British Empire. It was the invention of electric elevators that allowed these structures to be built. In their day, they were considered enormously high. Even today, New York City is the only city in the world that has more skyscrapers than Toronto. The Traders bank was designed by the New York architects Carrere and Hastings, with the assistance of Francis S. Baker. In the years ahead, these architects were to design such architectural Beaux-Arts gems as the New York Public Library. The banking hall of the Traders Bank was two-storeys in height, occupying the second and third floors. The staircase from the ground floor entered the banking hall in the centre of the enormous hall, the tellers’ cages located around the perimeter of the room. This was a new concept in the city, its design considered an impressive sight. The exterior walls of the banking hall have tall rectangular windows with ornate columns decorating the spaces between them. High at the top, a projecting cornice hides the top floors from being viewed from ground level. This has the effect of making the building appear shorter than it really is and it thus dominates the street less than otherwise. This technique, of setting the top floors back from the base, is now a common feature of many high rise buildings. Ground floor of the Traders Bank and the two-storey banking hall on the second and third floors. The banking hall is not in use today. Architectural details on the banking hall. The columns are topped with a ornamented Doric columns. This photo from the Toronto Archives shows the Traders Bank in 1912. The protruding cornice on the west facade, over-looking Yonge Street, hides the upper floors from being seen from street level. The construction site beside it is where the CPR Building would eventually rise. The view is looking south on Yonge Street. This 1912 photo was taken form atop the Traders Bank. The bank had a commanding view of its surroundings as no other structure was as tall as the bank. The view gazes south, with Yonge Street visible in the lower left-hand corner of the picture. Looking north on Yonge Street in 1910, the Traders Bank on the right-hand side of the photo. View of the Traders Bank in May of 2013, looking north on Yonge Street as in the previous photo. The young artist from Nova Scotia, who signs his graffiti art “Uber500,” has scored another hit with his work on a garage in the Kensington Market, on the west side of Augusta Avenue, a short distance north of Dundas Street. The work contains Uber’s favourite character, a yellow bird resembling a chicken, and sea creatures. In this work, a dog is also featured. The pictures that follow in this post are indeed colourful, and are a welcomed addition to the graffiti art of the Kensington Market, where Uber has several other excellent contributions. July of 2011, a post about the abstract expressionists. August of 2012, comparing the work of the graffiti artist Uber5000 to the abstract expressionists. The 1892 addition on Front Street, to Toronto’s early-day Union Station on The Esplanade. Toronto’s magnificent Union Station of today, on Front Street across from the Royal York Hotel, had a predecessor that was also located on Front Street, but further to the west. The original part of the station was opened On July 1, 1873, on the Esplanade, between Simcoe and York Streets. In 1892, the station was enlarged and a new grand entrance built on the south side of Front Street. It was connected by a walkway to the original part of the station on the Esplanade. For several decades, it was the gateway for immigrants arriving in Toronto by rail. In the years prior to the age of air travel, almost everyone who came to the city arrived by train. At the rear of the station, on the Esplanade, there were many rows of train tracks. When the old station was built, the Esplanade was on the shoreline of Lake Ontario. In the years ahead, landfill would extend the shoreline further south. When the station opened in 1873, the arrival and departure areas were not covered, so passengers were at the mercy of the elements. Eventually, to protect passengers, they built a cavernous hemispherical iron dome over the tracks, enclosed at either end with expansive panes of glass. The pillars supporting the dome appeared insufficient to support the massive weight of the towering structure. In the arrival area, after passengers had retrieved their luggage, they proceeded up the stairs that led to a narrow elevated walkway that crossed over the tracks. Then they entered a larger passageway that crossed over Station Street. It led to a double set of swinging doors that opened onto the Grand Hall, which was about the same size as that of today’s Union Station. However, it was square-shaped, rather than rectangular. Its elegant splendour and vaulted ceiling with its intricate classical designs amazed travellers. Near the top of its soaring walls were small, circular windows that allowed daylight to penetrate, splashing ribbons of light and shadow across the domed ceiling. Throughout the Grand Hall was an abundance of brightly polished brass. Every hour throughout the day, employees laboured endlessly to remove smudges and fingerprints, no opportunity ignored to remind travellers that they had arrived at a transportation temple of significance. Some stated that the hall’s magnificence resembled that of an ancient European cathedral. The train station also attempted to satisfy the more mundane needs of travellers, as it contained a souvenir shop, a newsstand, and a row of shoeshine chairs. Tickets were sold at an endless line of wickets adorned with brass grillwork. The huge benches of solid Canadian oak, over three inches thick, with elegantly carved backs, resembled church pews. They possessed no armrests. Weary travellers often reclined on these benches to nap while awaiting trains. The above information was obtained from Bernard Aldridge, who as a young man, was in the station many times. Toronto’s waterfront shortly after the old station opened to the public in 1873. The three pointed towers on the south facade of the station, which over-look the train tracks, can be seen. This view is looking east from John Street. In the above photo, there is no dome over the arrival area. The tower of St. James Cathedral on King Street East is evident in the upper-left corner of the picture. The lake is directly behind the station, to the south of the Esplanade. This photo was taken later than the previous one and shows the enormous dome constructed over the arrival area. Landfill has been employed to push the lake further south to create space for rail yards and buildings. Trains exiting from beneath the dome over the arrival area of the old Union Station. High above the tracks, can be seen the large panes of glass that enclosed the dome. Photo was taken in 1907. View is beneath the great dome of the arrival area, and the staircase that led up the narrow elevated walkway that allowed passengers to cross over the tracks. This photo was taken on 3 March 1928, at Front and Simcoe Streets. It looks east from the north side of Front Street. The building with the large square tower is the 1896 addition to the old Union Station. The enormous brown stone archway over the entrance can be seen. This 1922 photo was taken from west of the station. The towers on the right-hand side of the photo overlook the arrival/departure areas and the great iron dome that covers them. The building seen on the left side of the photo, with the large tower, overlooks Front Street and contains the Great Hall. This picture shows the immense size of the station, from its south side where the tracks are located, to its north facade facing Front Street. This 1923 photo looks northeast toward the south facade of the station, the north tower on Front Street also evident in the top/right-hand corner. The multitude of coaches demonstrates the popularity of passenger train travel in this decade. Union Station looking west in 1927. The new Union Station, which remains in use today, was officially opened in this year by the Prince of Wales, even though it was not yet ready for passengers. The old station remained in service, but demolition of the buildings to the south of it had already commenced.